One of the strongest arguments in favor of increasing big-city density is that it raises economic productivity. The higher the density, the more productive everyone is. In a rough sense, this is something nobody argues with: big cities have been cauldrons of innovation and progress for millennia. And there’s certainly no question that workers in big cities earn more on average than workers elsewhere. But can this be quantified? 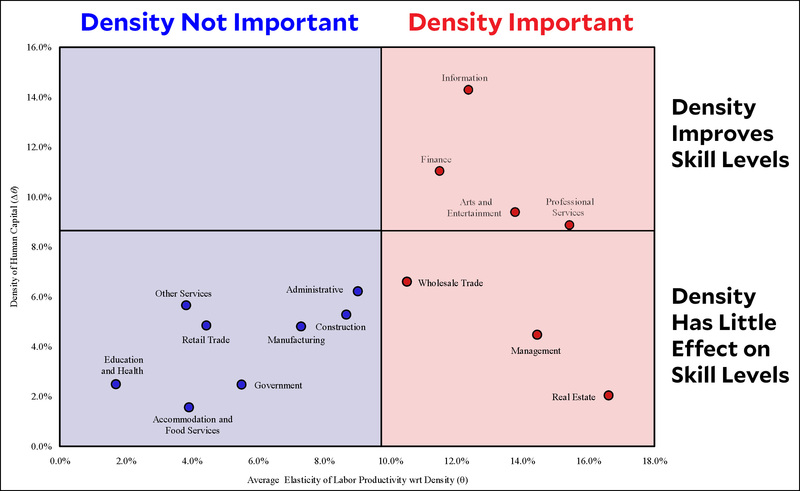 What this says is that density is important for certain kinds of jobs but not others. In the arts and entertainment, for example, density leads to higher wages essentially because of competition: being in the middle of a big arts community makes everyone better and shoves out those who aren’t top notch. In real estate, density increases wages even more, but for some other reason entirely. It’s not clear what that reason is, but it’s not because a big real estate sector makes real estate folks any better at their jobs. Finally, there are the sectors where density just doesn’t play much of a role at all: retail, manufacturing, education, and so forth. Metropolitan areas with a human capital stock that is one standard deviation below the mean realize no productivity gain…while doubling density in metropolitan areas with a human capital stock that is one standard deviation above the mean yields productivity benefits that are nearly two times larger than average (i.e., 3.6 percent compared to 1.9 percent)….On average, we find that a doubling of density increases metropolitan area productivity by 2 to 4 percent. Density isn’t a magic elixir. Other things equal, a denser city will be more productive, but density alone isn’t enough to generate wealth….Within the American economy, New York is the country’s densest city but not its most productive. ….Density itself is subject to diminishing returns….At some point, the marginal worker adds less in benefits than he does in congestion costs. At some point, the marginal skyscraper floor costs more than the benefits its occupants deliver….It is enough to note that density is important and that our actions often constrain cities at levels less dense than markets would seem to prefer. The shape of the city in space, including for example its residential density, matter much less than (and are mostly accounted for by) population size in predicting indicators of urban performance. Said more explicitly, whether a city looks more like New York or Boston or instead like Los Angeles or Atlanta has a vanishing effect in predicting its socio-economic performance. Some researchers believe that higher density produces higher productivity. One of the most carefully done papers estimates an increase of 2-4 percent for a doubling of density, though there are others with higher estimates. Some researchers believe that density has no effect at all. The only thing that matters is the raw size of the entire metropolitan area. In either case, the effects are greater in areas with higher levels of skills and education. At some point, density and population reach a level where there are no further gains to growth. We don’t know what that level is. This appears to be the current state of research. Density has either no effect or a small effect on productivity, and at some unknown point it probably starts to make things worse. I wish there were something more definite to report here, but it’s just a hard subject to measure. UPDATE: In the original chart for wages vs. population, I showed wages increasing exponentially with population. In fact, it’s a power law relationship. Both the chart and the text have been corrected.